The new V604T phone from Toshiba adds an analog TV and FM tuner to the standard mix of features including a 1.3-megapixel camera, music player, and miniSD card among others. Toshiba's press release advises that analog TV will be unavailable as of 2011—as if anyone keeps a cell phone for five years anyway. 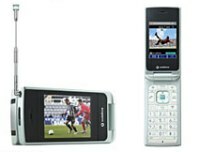 The phone can record TV and capture screen stills to memory. Sorry, folks, Japan only for the time being.